Took outfit shots early this morning and felt like posting them on the blog today as well. Wow, that’s a first for me! I’m usually very lazy lol. That’s #OOTD at its best! Keeping it simple today because I want my new baby to be the star here. 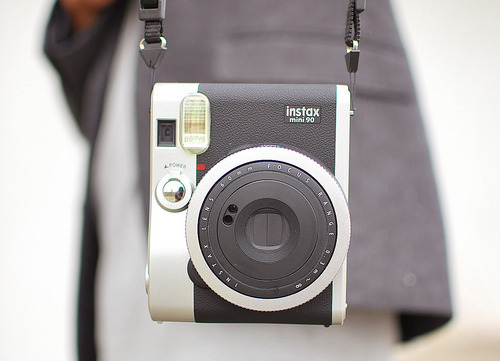 Yes, the new Instax Mini 90 Neo Classic is finally out! I’m going to the launch event in a bit and this is the outfit I came up with! I wanted the color palette of my outfit to match the new instax! Hope you guys like it! What I’m wearing: tweed blazer (H&M), shirt (H&M), drop crotch pants (H&M), instax mini 90 neo classic (Fujifilm), boots (Palladium). Hype this on lookbook here. 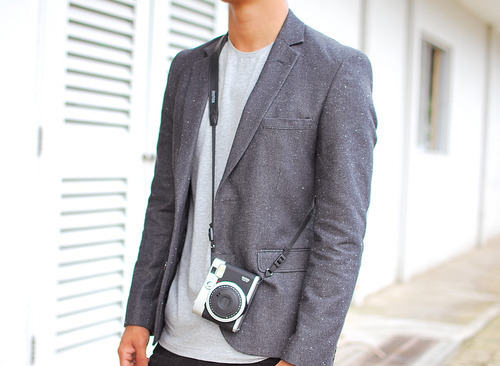 Tweed blazer from H&M | Grey shirt from H&M | I am digging this blazer because of the fit and fabric. Two important things you should consider when buying clothes! The blazer sort of looks like it has built in dandruff but I like it! LOL what am I saying. I guess it’s too early for my brain to function haha! Instax Mini 90 Neo Classic from Fujifilm | The new instax gets a few extra features such as macro mode, bulb mode and my favorite—the double exposure mode! By pressing the shutter button twice, you can superimpose 2 different images in one frame! I’m still getting the hang of it! I’ll share you the photos I took soon! I own an Instax mini 7S and a mini 8 but I have to say, the Mini 90 Neo Classic is the best one yet! Not only is it equipped with tons of new features and functions but it looks sleek and masculine as well, don’t you think? I didn’t even bother wearing any other accessories today! 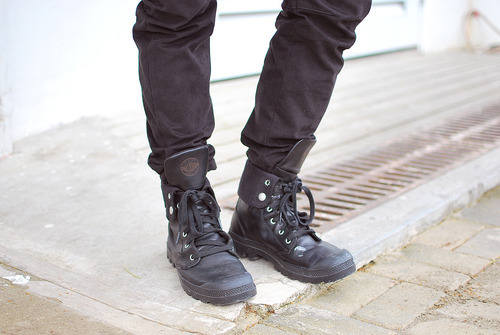 Boots from Palladium | After months of beating up these babies, they’re finally as slouchy as I wanted them to be! The bird poop on my left shoe was a nice touch as well, haha!